Who’s ready for Santa’s Electric Light Parade hosted here in Old Town Temecula Ca Just a few miles away from Paradise Chevrolet Cadillac in California! This event is taking place on Friday November 30th 2018 at 7:00pm the event is rain or shine so get ready and dress warm for this amazing holiday event. Starting at the intersection of Del Rio and Jefferson the parade will make its way south. Parking will be located in the Temecula Old Town Parking Structure, Old Town Temecula front street will close at 6pm. To access the parking structure please use the 2nd street from the south and Moreno to Mercedes from the north also the dirt lot on the corner of Ynez/Santiago will be open to parking. Vendors will be out there selling Glow in the dark items, kettle corn and doughnuts. If you worried about a good Viewing spot to watch there is a spot on Jefferson between Rancho California and Del Rio on the west side of the street only. There will be an announcer in this area. Viewing is also along the Old Town Front Street south of Ranch California to the intersection of Santiago. A reminder for our fellow Temecula residents that Jefferson will be closed heading south at Overland from 3:45pm – 10pm, Del Rio Closed 4pm-10pm, Las Haciendas closed 4pm-10pm, Calle Cortez closed 4pm-10pm, Jefferson Ave- Via Montezuma to Rancho California southbound only closed from 5pm-9pm, Second, Third, Fourth, Fifth, Sixth & Main streets from Mercedes to Murrieta Creed closed from 6pm – 10pm, Old Town front street from rancho California to Santiago closed from 6pm – 10pm, Old Town Front From Santiago to Harley Davidson closed from 7pm – 11pm, Rancho California Road- Old Town Front to Diaz road closed 7pm -9pm. All of us here at Paradise Chevrolet Cadillac located here in Temecula hope to you see you out there enjoying this awesome Christmas Holiday local event. On October 2nd 2018 Paradise Cadillac Unveiled the all New 2019 Cadillac XT4 and hosted a party to celebrate! Attendees were able to get an exclusive first look at the all new XT4 while our knowledgeable sales staff went over any questions with them. Cadillac was here as well providing an exceptional VR experience for customers getting a closer look into the XT4 world and were able to custom build it to their specs. Hors D’oeuvres, live music and prizes were given out. Congratulations to Rose Bendas for winning the Trip to Catalina Island we hope you enjoy your stay. Check out the party below! On Sunday August 5th 2018 Paradise held the 16th Annual Mystery Lunch Run for the Corvette Club Of Temecula Valley. Hosted by Lou Long himself with the help of his wife Julee. This was the Largest Mystery Lunch Run to date! Check out the full video below! With 52 corvettes and 104 people attending this event it was definitely one for the books. With an arrival time around 9AM our front parking lot was full of all different kinds of Corvettes. From old school to new school, Lamborghini doors and custom paint jobs. Every corvette with its own style it was a sight to see! With Coffee and Donuts at the front desk what more could you ask for! It was great seeing all kinds of new faces that are joining the club. It makes us look forward to next years meet even more! We hope everyone who came out enjoyed this event and we will see you next year! Check out the official website of the “Corvettes of Temecula Valley”! Chevy has spent the last 100 years working hard to earn a reputation for making the most dependable, longest-lasting full-size pickups on the road. Whether you’re looking for the refined comfort of High Country, the aggressive capability of Trail Boss or the rugged functionality of Work Truck, the next-generation Silverado truck lineup offers the right tool for every job. The 2019 Models include, High Country, LTZ, LT Trail Boss, RST, LT, Custom Trail Boss, Custom and Work Trucks. With an all new design added to this truck us here at Paradise Chevrolet Cadillac can’t wait to get some in stock! This truck has been formed to function, creating better aerodynamic results to improve it’s efficiency for everyday use. The next-generation Silverado takes space, convenience and comfort to the next level with a cabin offering more rear leg room, more storage space and enhanced climate controls. Rockstar Energy Husqvarna Factory Racing is please to announce the four -year extension of Jason Anderson’s Contract. He has been successful with the brand since he was signed in 2014, with multiple race wins and podium finishes. Anderson is an elite athlete that is an integral part of the team. He will be contending both AMA pro Motocross and AMA Supercross, where he claimed second overall at Anaheim 1 aboard the all-new Rockstar Edition FC 450. Over 15,000 riverside county families, senior citizens and children were helped during the 2016 holidays. This year… the need is even greater. Please join us to bring a bit of hope to those in need this Holiday Season. There are many ways to get involved! Financially, Logistics, Donations, and more… Please let us know how we can count on you! Come in and drop off your donation today! Cash or Gift Certificates, Grocery Store Certificates, Non-Perishable Food Items, New Unwrapped Toys, New Gifts or Gift Cards for Teenagers! Gas Cards. Christmas Dinner: Help a Family in Need! We are offering a Turkey Dinner with all the trimmings for just: $39.95 Help make a Christmas Wish come true! Put a smile on the face of a child, senior! Visit us today to drop off your Donation here at Paradise Chevrolet Cadillac. LAS VEGAS — Chad Hall of Hall Racing will debut a modified 2017 production Chevrolet Colorado ZR2 during Best in the Desert’s General Tire “Vegas to Reno” race presented by FOX. “Vegas to Reno,” known as “the longest off-road race in the United States,” begins at 9:30 a.m. on Friday in Las Vegas and ends at various times on Saturday morning, August 19, in Reno, Nevada. More than 350 contestants are expected to participate this year’s 550-mile race. The course encompasses a wide array of grueling terrain, from silty desert wallows, to dry lake beds and mountain passes as high as 8,000 ft. above sea level. 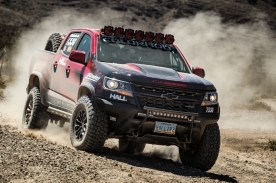 Entered in class 7300, which comprises stock production mid-sized pick-ups and SUVs, Hall Racing’s modifications to their ZR2 include sanctioning body-mandated safety items such as a roll cage, a 44-gallon racing fuel tank and racing seats with safety harnesses. KC HiLites racing lights, two-way radios and a GPS system have also been added. The truck retains the stock ZR2’s 3.6L V-6 engine and eight-speed automatic transmission, along with a modified version of ZR2’s Multimatic DSSVTM damper technology. 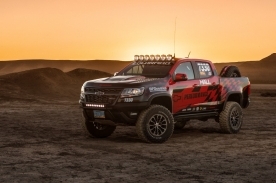 In addition to Hall Racing’s alterations, this crew cab ZR2 acts a testbed for Chevy Performance and hints at a range of potential parts to be offered for ZR2 as well as the standard Colorado. 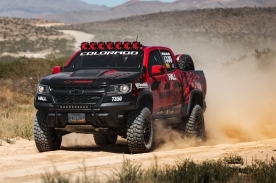 “The components being tested on this truck are ultimately intended to take the already-exceptional off-road capability of the Colorado to the next level,” said Russ O’Blenes, director, Performance Variants, Parts and Motorsports for General Motors. 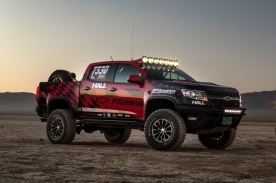 Hall Racing, the winningest family of off-road racers in the legendary Baja 1000, has a long history of racing with General Motors production-based vehicles in both Best in the Desert and SCORE desert series. The 2018 Chevy Equinox: See What All the Commotion is About! The 2018 Chevrolet Equinox has been completely redesigned and restyled for the new model year, and the new-and-improved Equinox is bound to be well-received by drivers and critics alike. The new model carries less weight and the chassis has been retuned, resulting in smooth handling on the road. The interior remains roomy and stylish, and technology features abound. This stylish crossover offers the best of performance, technology, and safety, and now is offered with a new engine option. The 2018 Chevrolet Equinox is now available with a fuel-efficient diesel engine, so you have several choices for your powertrain. All three powerful engine choices for the Chevy Equinox offer the power you need to get where you want to go, and they all come standard with stop/start technology to further enhance fuel efficiency. The standard 1.5L Turbo engine offers great acceleration in both the front-wheel drive and all-wheel drive model with 170 horsepower and 203 lb.-ft. of torque, and delivers what Chevy describes as “the optimal balance of power and efficiency,” with a GM-estimated 32 mpg highway. The available 2.0L Turbo engine offers a more dynamic driving experience paired with an all-new 9-speed automatic transmission delivering 252 horsepower and 260 lb.-ft. of torque. The exciting new 1.6L Turbo-Diesel engine is smooth, quiet, and delivers a remarkable GM-estimated 39 mpg on the highway. Whichever powertrain you opt for, you’ll enjoy versatility and style that come standard on every Chevy Equinox. Paradise Chevrolet Cadillac in Temecula, CA currently has a fantastic inventory of 2018 Chevy Equinox models in stock, so stop by to test drive all three of the Equinox powertrains to decide which one is best for you!